A telescope high atop a volcano peak in Hawaii has set a new asteroid-hunting record: 19 space rocks discovered in one night, the most ever by a single telescope, astronomers say. 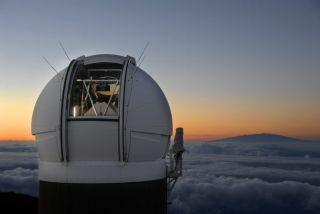 The Pan-STARRS PS1 telescope, located at the summit of Maui's Haleakala volcano, set the mark on Jan. 29, discovering 19 near-Earth asteroids. Two of the space rocks have orbits that will bring them extremely close to our planet in the next 100 years, so scientists will be keeping an eye on them, researchers said. "This record number of discoveries shows that PS1 is the world's most powerful telescope for this kind of study," Nick Kaiser of the University of Hawaii, head of the Pan-STARRS project, said in a statement Thursday (Feb. 24). "NASA and the U.S. Air Force Research Laboratory's support of this project illustrates how seriously they are taking the threat from near-Earth asteroids." Scientists discover asteroids by tracking their movement against the relatively static background of stars. To confirm their finds, researchers must make multiple observations within a few days or so to define the asteroids' orbits. Otherwise, the asteroids are likely to be "lost," researchers said. Pan-STARRS PS1, which has been billed as the world's largest digital camera, is designed to snap hundreds of photos of the sky each night, then compare them to find moving asteroids in deep space. Pan-STARRS astronomers picked up 30 potential asteroids on the night of Jan. 29. They sent their discoveries to the Minor Planet Center in Cambridge, Mass., which collects and distributes data about asteroids and comets, allowing other astronomers to re-observe the objects. Richard Wainscoat (left) and Marco Micheli study one of the near-Earth asteroids found on Jan. 29, 2011, using the Pan-STARRs PS1 telelescope in Hawaii. The asteroid is the roundish dot near Wainscoat’s finger. This helps spread the confirmation workload around to different teams, but the weather didn't cooperate well in this case, researchers said. "Usually there are several mainland observatories that would help us confirm our discoveries, but widespread snowstorms there closed down many of them, so we had to scramble to confirm many of the discoveries ourselves," said Richard Wainscoat, also of the University of Hawaii. Wainscoat and several colleagues spent the next three nights following Jan. 29 searching for the asteroids, using telescopes at Mauna Kea Observatories in Hawaii. They were able to confirm 12 of the space rocks, and other telescopes around the world confirmed another seven, bringing the total to 19. The other 11 candidates got away, moving too far to be found, researchers said. Two of the newly discovered space rocks will zip pretty close to Earth in the relatively near future. They pose no immediate danger, but a collision in the next century or so cannot be ruled out, researchers said. The Pan-STARRS PS1 telescope ("PanSTARRS" is short for Panoramic Survey Telescope and Rapid Response System) was designed specifically to hunt for potentially threatening asteroids. It has a main mirror 60 inches (1.8 meters) wide and a powerful digital imaging system that includes a 1,400-megapixel camera. PS1 began searching for asteroids in May 2010. The telescope takes more than 500 photos of the sky every night, researchers said. A NASA team and other dedicated astronomers routinely search for near-Earth asteroids that could pose a potential impact risk to Earth.